Here's another interesting bit of conjecture on the fate of MH370. Chris Goodfellow, a pilot of over 20 years and a Canadian Class-1 instrument-rated pilot for multi-engine planes, suggests that the most likely culprit for the disappearance of the 777 was a catastrophic electrical fire. 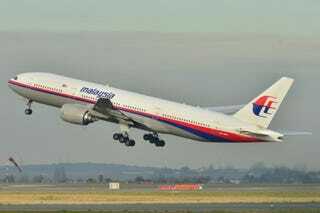 He believes that the turn to the southwest, which occurred after the last radio transmission, was the pilot's attempt to return to the best airport for a safe landing of the stricken airliner. The left turn is the key here. Zaharie Ahmad Shaw was a very experienced senior captain with 18,000 hours of flight time. We old pilots were drilled to know what is the closest airport of safe harbor while in cruise. Airports behind us, airports abeam us, and airports ahead of us. They're always in our head. Always. If something happens, you don't want to be thinking about what are you going to do–you already know what you are going to do. When I saw that left turn with a direct heading, I instinctively knew he was heading for an airport. He was taking a direct route to Palau Langkawi, a 13,000-foot airstrip with an approach over water and no obstacles. The captain did not turn back to Kuala Lampur because he knew he had 8,000-foot ridges to cross. He knew the terrain was friendlier toward Langkawi, which also was closer. As for the loss of the transponder, this would be expected in such an emergency situation. If the fire could not be controlled, either by pulling the busses or changing altitude, and the crew and passengers were overcome by smoke, it is possible that the plane would continue on autopilot until it ultimately crashed in the Indian Ocean.